In 2014, Dr. T.J (Jock) and Janet Murray lost their daughter, Suellen Murray, BPR, LLB., after a three-year battle with cancer. To honor her love of the Public Gardens, her parents and her husband, Byron Rafuse, established a bursary in her honor. The Suellen Murray Educational Bursary was established to encourage and support educational activities or projects relevant to the Public Gardens. At the Victoria Day Tea on Monday, May 22, Janet Murray and the Friends of the Public Gardens announced Claire Halstead, Ph.D. as the award recipient for 2017. Claire recently chose Halifax as her place of residence following years of living and studying in Europe and completion of a postgraduate degree in History at the University of Western Ontario. She is currently a Research Associate at the Gorsebrook Institute, Saint Mary’s University. Her project “150 Years as the Heart of Halifax: A Project on Public Engagement and the Halifax Public Gardens” was selected from amongst four applications, all which showed originality, creativity and clear relevance to the Gardens. Claire will conduct her research over the summer. Once complete, it will be used to create an educational exhibit in the Public Gardens, one of over 150 events recognizing the 150th anniversary of the Halifax Public Gardens. by emailing heartofhalifax150@gmail.com and see the Heart of Halifax Project tab on the top of this website. 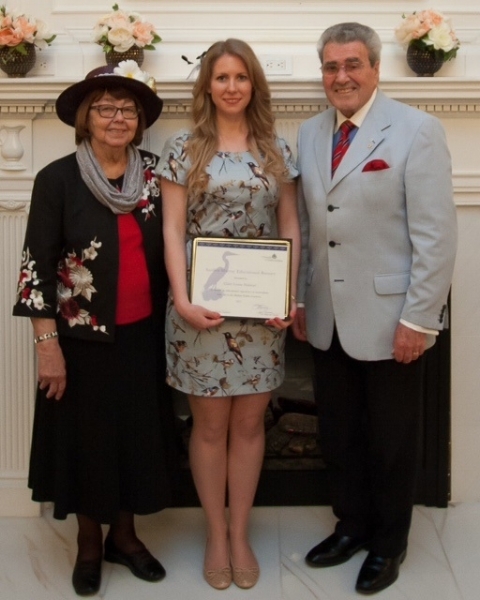 Picture: Dr. T.J (Jock) Murray and Janet Murray present the Suellen Murray Educational Bursary to Claire Halstead, Ph.D. at the Victoria Day Tea Party.